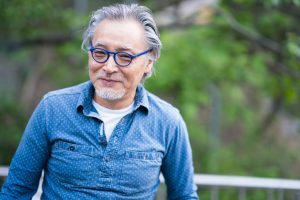 Aging men and women, particularly the latter, have long felt pressured to hide their gray hair. In the 1930’s, Jean Harlow bleached her hair because she felt that her reputation as a platinum blonde was essential to her career. During World War II, Clairol ran ads referring to gray hair as a “heartless dictator,” claiming that it forced women into “the older set” (implying, of course, that the older set was undesirable). Perhaps unsurprisingly, there are few silver-haired role models in the media, especially for women. As of 2017, only 1 of the 32 women on the Fortune 500 list and none of the 15 women newly sworn into Congress had white or gray locks. On the pop culture spectrum, since Esquire launched their “Sexiest Woman Alive” feature in 2004, none of their featured “winners” have had anything but blonde, brunette, or black hair. 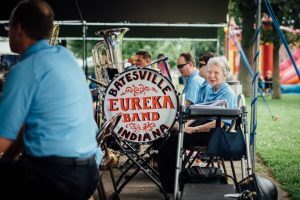 From the Viva Center’s own perspective, when we searched for pictures of glamorous, gray and silver-haired individuals to pair with this blog post, it took actual hours and the results were slim. Yet attitudes appear to be shifting, causing publications like the Huffington Post and Glamour to dub gray hair “trendy.” Some attribute this to campaigns from companies like Dove that advocate “real” beauty. Others believe it’s the result of having more silver-haired icons in the media, like Danaerys Targaryen from Game of Thrones and Storm from X-Men. No matter the cause, many people are choosing to keep their hair natural, or even to go gray at a relatively young age—in 2016, the fad of 20 year olds dying their hair gray became so popular that it was the subject of a multiple articles in the New York Times, including these two, which focus on women and men, respectively. In the midst of this cultural change, we spoke with Viva’s founder and owner Dr. Julie Lopez about her own transition from dyed to gray hair. 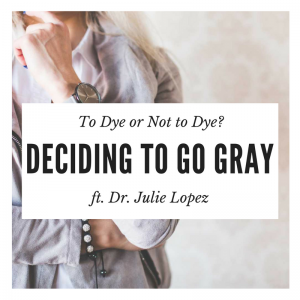 “The decision to color my hair was actually the challenging one,” Dr. Lopez shares, noting that as a young clinician, she wanted gray hair because she was “desperate for signs of my deep wisdom… I would lovingly try to showcase my three gray hairs, hoping my clients would notice and see them as a sign of my life experience.” She switched to dying her hair in her 30s after actual years of experience made her less concerned with “appearing” wise. Dr. Lopez is unique in her initial trepidation to dye her hair. A 2008 study by Clairol found that 75 percent of women in the US dye their hair, with 88 percent saying that their hair has an effect on their confidence. Yet some women make this decision not because they’d prefer colored hair, but because they feel pressured by their hair stylists. Marilyn Divine, owner of Leepin’ Lizards hair salon, notes that “a lot of hairdressers” persuade their clients to cover up any signs of graying. Of course, it’s in a hairdresser’s interest to keep us coming back for dye jobs. Dyeing hair can be significantly more expensive than cutting it—as of 2012, the average cost of a haircut for women in the US was $56, while the average cost for permanent hair color was $83. Further, colored hair requires regular upkeep. By dyeing your hair, a stylist is practically guaranteeing repeat service at a high rate. Perhaps this explains why our stylists keep encouraging us to get dye jobs. Dr. Lopez ultimately resolved this problem with an ultimatum—she was going gray with or without her stylist. Her hairdresser conceded, and for the past six months, Dr. Lopez has been growing her gray out. The decision came with some insecurity. Psychology Today notes that many women fear that when they go gray, the people around them will perceive them as “letting themselves go.” Dr. Lopez admits that she often feels the need to explain to people that she is “under professional guidance and that we do have a plan. I want people to know that I’m still caring for myself.” Other initial concerns included whether her partner would still find her attractive and whether strangers would treat her as less valuable because of how gray hair signaled her age. Now, going without hair dye is Passey’s active choice. She’s found that her white hair is “much softer and silkier” than it was when she dyed it, and many of the women around her who’ve chosen to go gray look “stunning.” She’s received “a bevy of compliments,” and her hair feels healthier than ever. Similarly, model Cindy Joseph describes how she began seeing her gray hairs as badges of honor. “I thought, ‘I’ve earned this! This is beautiful!” The same day that she cut off the last of her blonde hair, she was approached on the street by a talent scout looking for models for Dolce and Gabbana. Thus began her current career. Dr. Lopez has noticed many upsides to going gray. For one, it “definitely helped [her] budget.” Additionally, choosing to defy societal pressures and go with the hairstyle that she liked best felt in line with her feminist principles. This, of course, doesn’t mean you have to go gray to be a good feminist—going with the color that you like the most, rather than the one society tells you to like, is empowering, whether that color is gray, blonde, or neon pink. “I am excited to be embracing my age and to be more of myself,” Dr. Lopez confides. She hopes to share more about the process of going gray as it continues. Did you choose to go gray? Conversely, do you love your dyed hair? Share your thoughts with us via Facebook or Twitter!